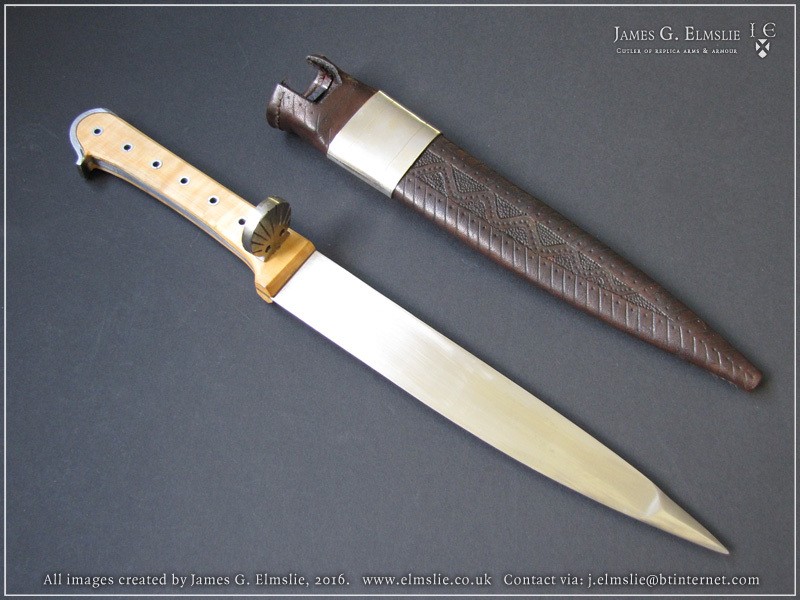 Forum Index > Makers and Manufacturers Talk > For Sale: A Hauswehr, or Peasant's knife of the mid-15th C.
Posted: Sun 21 Aug, 2016 9:17 am Post subject: For Sale: A Hauswehr, or Peasant's knife of the mid-15th C.
I'd just like to show an example of work which is available for sale right now. 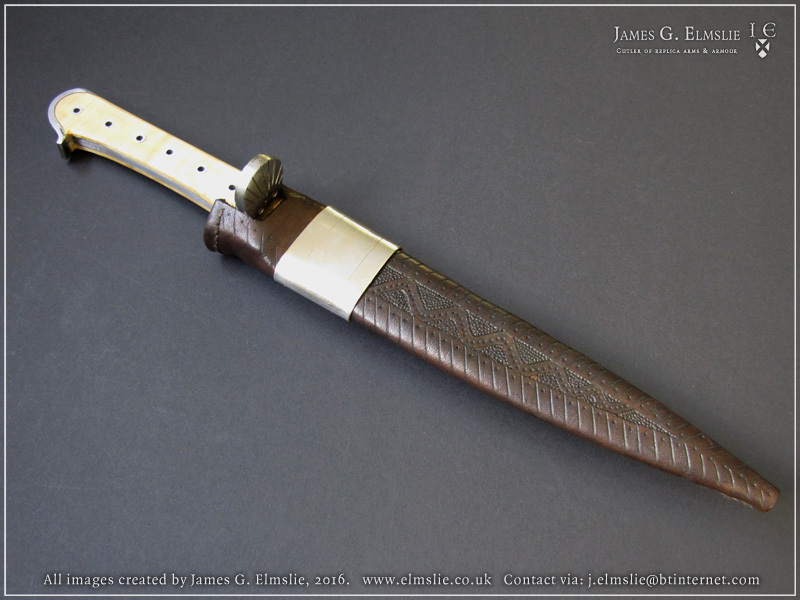 Handmade in EN45 steel and antique wrought iron, with a reinforced point which swells out to a strong diamond-section, this is a reproduction in the style of the lower-class peasant knives of mid-15th century Bohemia, southern Germany, or the western regions of the Kingdom of Hungary. As an example of the lower-class arms, the surface finish is deliberately kept simple, with a satin polish rather than mirror finishing. More notably, and it lacks any sort of bolsters on the front of the boxwood scales, a detail commonly lacking on many surviving examples, but very rarely reproduced. Despite lacking such elements however it does have a scallop-shell patterned nagel projection, again forge-worked from antique wrought iron, riveted in place forward of the long grip with its rolled tubular rivets. 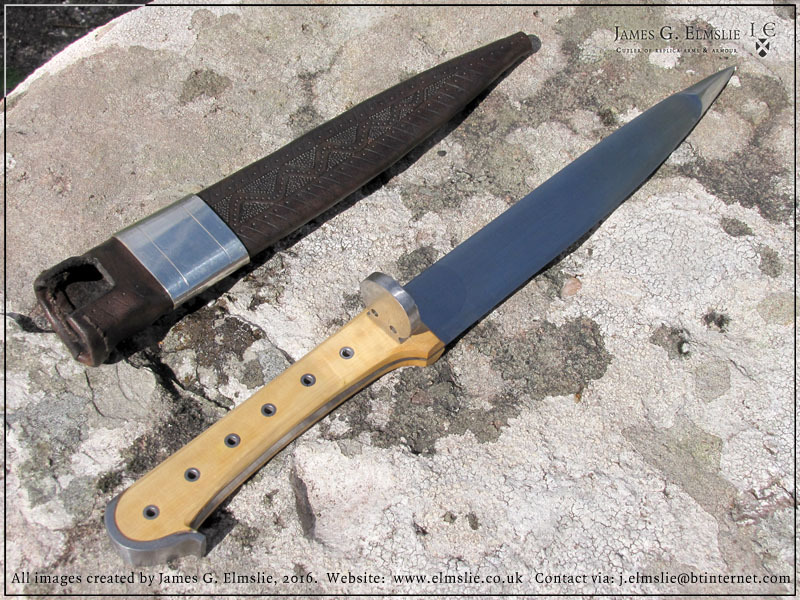 The use of the nagel, combined with a reinforced tip clearly indicates the nature of this as a fighting knife. 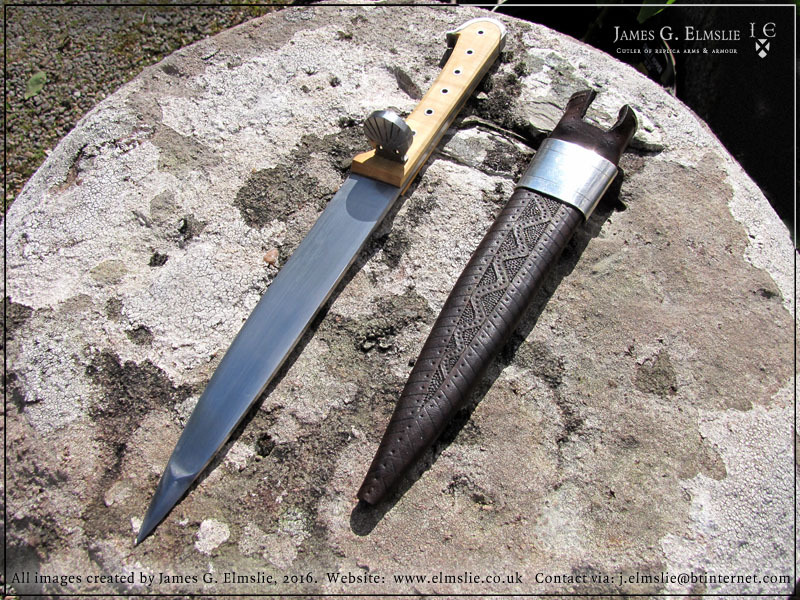 The sheath is inspired by a partially surviving Czech example (Slezské zemské muzeum Opava, inv. c. V 5/9; 9III5, Published by Žákovský, 2014, Cat.no 185. ), of a metal collar and zig-zag line decoration. While the original metal of the collar was a lead-tin alloy, for modern considerations of safety, the reproduction consists of a collar of brass, tinned for the same white metal finish. Its an unfortunate compromise, but one required for modern safety concerns. The vegetable-tanned leather sheath consists of two layers, sewn with linen thread, and tooled on the outer face. If I hadn't already got a rather extravagant, bohemian variant of a hauswehr from him (not to mention the complete hauswehr set currently in the works), I'd pick this up in a heartbeat. As it is, yet another hauswehr would not be the most reasonable addition to my collection.